Every developer regularly faces cases when it's needed to find out where some field is used — either to understand possible side-effects on some changes to a field or to understand some logic or processes that happen in an organization. The Welkin Suite gives you an ability to find all places where a certain field is used for the whole project. Use the Field usage report to get all the information in a handy way. The Welkin Suite offers you multiple ways to open the Field Usage Report, so it's always at your hand. 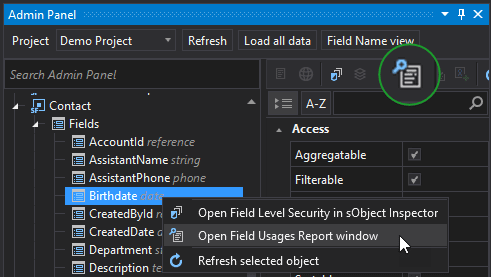 Admin panel — you can open the Field Usage Report using the context menu for any field — select the Open Field Usage Report window here. Also, you can use the corresponding button at the toolbar of the panel after selecting the field you want to explore. 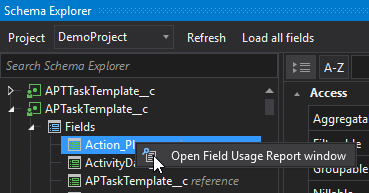 Schema Explorer — you can open the Field Usage Report using the context menu for any field — select the Open Field Usage Report window here. Fields tab of the sObjects Editor — open any object file in the editor and click on the Open Field Usage Report window button at the toolbar. The IDE scans your local files and looks for field usages in different places and takes into account expressions, relations, macro usages in templates, etc. — and this is the main difference from doing just simple 'Search All' across the whole solution. Using this intelligent approach, the IDE can show you lots of different things in a handy way. 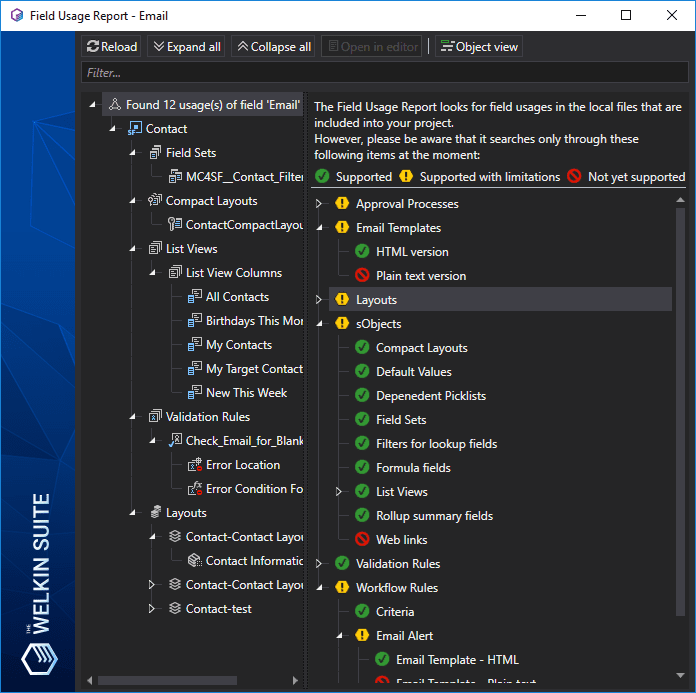 Workflows — in the same way as in Approval Processes, the IDE looks for a field usage everywhere in the Workflow, where plain text email templates are the only exception. Each time you open a Field Usage Report, you will see this information in a tree-like view. When the report is opened, the IDE shows you a tree view of all places where the field is used. By default the list has the Object view — all locations (except Email Templates) are shown under corresponding objects, where they are defined. In the Object view it is very easy to detect logical dependencies between objects or analyze how exactly this or that field is used in different objects. If you'd like to look from another perspective — analyze the impact of a field on business logic or identify something like a character of a field (if it's an 'output' field that's only used for displaying something or if it's an 'input' field, that is used in lots of formulas and affect calculations and processes), you can switch to the Type view using the corresponding toggle button in the toolbar. In the Type view the location type (e.g. approval process, validation rule, workflow, etc.) will be shown as a first level in the tree, while objects and further details will take place on lower levels of the tree. You can also expand all the rows with the help of the Expand all button. The Collapse all button will collapse all the expanded rows back. To get the latest data, click the Reload button. To quickly find a necessary field, use the Filter input above the list of fields. As you select any 'occurrence' (a last item in the tree hierarchy) in the left part of the report, you will see its details on the right part of the screen. Usually, TWS gets these details directly from an XML representation of an item, so you will be able to see all needed information. As well as double-clicking on any occurrence or selecting any of them and clicking on the Open in editor button — the IDE will navigate you directly to a file and line where this usage was found, being it field update, email template, criteria, or anything else. To see what exactly information is available to you in more details, navigate to the corresponding page below.